Maka Dai Dai Shogi is one of the 'Large Shogi variants' of which records have been preserved since medieval times, and large it is indeed. 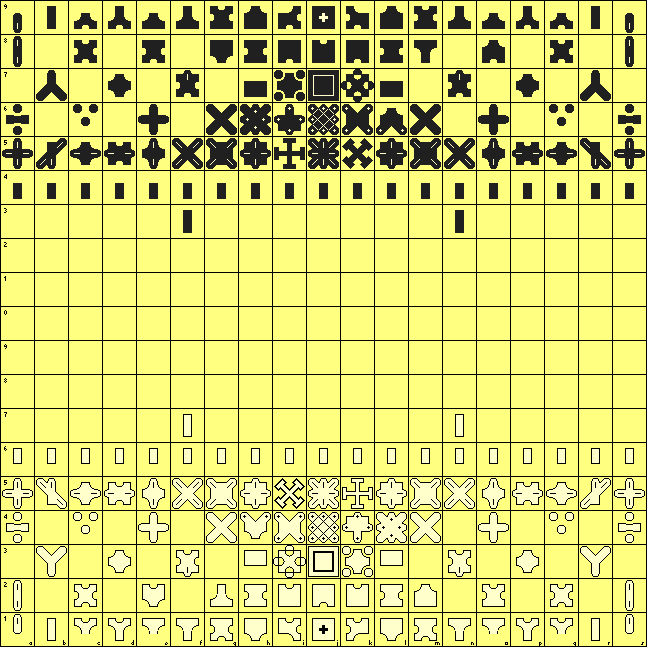 On a 19x19 board each side starts with 96 pieces of 50 different types, making this double the size of Chu Shogi, which was the dominant for of Chess in Japan in those days. The vast majority of piece types have only stepping or (limited-range) sliding moves, as oblique leapers are virtually non-existent in Shogi, give or take an occasional Knight. The number of piece types can be so large because the pieces in general lack the 8-fold symmetry that all orthodox Chess pieces (except Pawn) have. By giving the pieces different ranges in the various directions this extraorinarily large number of piece types can be constructed. Some pieces even break the left-right symmetry that even the FIDE Pawn still respects. So most of the 50 piece types have quite ordinary Rook or Bishop moves, and many are in fact 'steppers', which have a sub-set of the moves of an orthodox King. A large number of these pieces is in fact exceedingly weak, with steps in just 2 or 3 directions. What spices up the game is a hand full of very powerful pieces, unique to the middle and large Shogi variants. One of their ingredients is the so-called 'Lion power', the ability to continue moving after having made a capture, and thus able to make multiple captures in one turn. Some other pieces are 'hook movers', sliders able to turn one corner in a place of their choosing, wich thus have an enormous number of move targets. Maka Dai Dai Shogi also has special rules to prevent trading of the strongest of these pieces, so that they won't easily disappear from the game, and are likely to survive up to the very end. Only the location of the pieces of one side are mentioned below, in normal (Chess-like) coordinates. The setup for the other side can be obtained by rotating the board 180 degrees. Most pieces occur in pairs located symmetrically w.r.t. the board axis. Where this is not the case, the pieces in symmetry-equivalent locations are often related, e.g. because they are mirror images of each other (when they are asymmetric themselves), or related by some 'playful symmetry', like 90-degree rotation, or exchanging orthogonal and diagonal moves. capability in each direction where it originally could step. pass a turn if there is an empty square next to it. The Emperor is a Universal Leaper: it can move to any square of the board. It cannot capture enemy pieces that are protected, though. That even holds for capturing the opponent's last royal. Protected here means that the Emperor could have been recaptured if the opponent would have been allowed to play on without royal. All pieces count as protected by the Emperor, so if both sides have an Emperor the Emperors could only capture each other, when left unprotected. The Hook Mover is a Rook that can (but does not have to) make one 90-degree turn in its path. The Capricorn is a Bishop that can do that. Like any slider, they have to stop at the point where they capture, and the (bent) path they move along must be empty up to that point. These pieces can leap directly (in addition to steps in other directions) to the second square along some orthogonal or diagonal. Such a jump is relatively rare in Shogi, when not part of a move with Lion-Power. The Knight and Pawn occur in their Shogi forms, i.e. the Knight only has the forwardmost two moves of the Knight in western Chess, and the Pawn captures as well as moves straight ahead. The game is won by capturing the last remaining opponent royal. Royals are King, Prince and Emperor. Almost all pieces in the initial setup can promote. This can happen anywhere on the board, whenever they capture something. There is no choice in what you promote to; each piece has a fixed promoted form. The promoted condition is 'contageous': whenever you capture a promoted piece you MUST promote. If you capture an unpromoted piece, you can choose whether to promote or not. There are good reasons to defer promotion, as often the promoted piece is weaker than the original one. Promotion is irreversible: once promoted the piece stays promoted for the rest of its life in the game, and cannot promote a second time (even when similarly moving pieces in the initial setup can). There is an exception to this, however: The Teaching King and Buddhist Spirit are also contageous, and whatever captures one of those, becomes one. This even holds for pieces that were already promoted. Capturing a Deva or Dark Spirit (the unpromoted forms of TK and BS) also makes you promote to TK or DS, respectively. Only (potentially) royal pieces, (Emperor, King, Prince, Drunk Elephant) are 'immune' to this, and will either promote to their own promoted form, or stay that way. The historic sources mention that repetition is forbidden, but do not elaborate on which side carries the burden to avoid it. It is likely that you could not win by perpetually checking your opponent, and that the burden to deviate was thus upon the checker, like in all Asian variants. The modern interpretation of this rule is that evading a perpetual chase, with moves that do not attack anythinging should also be always allowed, so that the chaser must deviate, and that repeats reached without either side attacking anything should be draws. Only when the protecting piece is a royal you can succesfully trade TK or BS. (But you would still not be very happy if that caused the opponent to promote to Emperor on the recapture!) When TK and BS capture each other, one of them will disappear, though. No game records or mating problems have survived from historic times, only rule decriptions. These don't always fully agree, though, so there is some controversy on how certain pieces move. Of course it is very possible that the game never had any universally accepted rules, but that its rules varied from place to place, or evolved over time. This description follows the current consensus as refleced in the English Wikipedia. There is some unclarity on the moves of the Free Bear. English Wikipedia says in addition to BsR it has an fA jumping move, which would be very unusual for a Shogi variant. Japanese Wikipedia gives it a forward diagonal step in stead of slide, next to the fA jump (and also has step + jump for the vertical moves of the Donkey). In both cases it is not clear why this piece would be called a 'Free Bear', as usually the label 'Free' is reserved for steppers upgraded to sliders, while there is no such relation with the moves of the unpromoted piece here. The same mystery shrowds the promoted form of the Angry Boar, (Free Boar), which logically should have moved as a Rook. The move mentioned here might have originated through confusion with Chu Shogi, which also has a piece called Free Boar, moving as BsR, but which is a promoted Side Mover there, making this move quite logical, (as the 90-degree-rotated VM promotes to BvR), and the naming likely just a coincidence. There are organized attempts going on in Japan to revive this game, with slightly different rules: The Furious Fiend is Lion + Lion Dog there, rather than Lion + K3, while Kirin and Phoenix promote to Lion and Queen as in Chu Shogi. Promotion is mandatory on any capture, and the Deva and Dark Spirit are not contageous, only their promoted forms Teaching King and Buddhist Spirit are. The Blind Bear there moves as FsW, to fit with the BsR of the Free Bear (which would still be the same as that of the Free Boar, though). A 50% smaller version of Maka Dai Dai Shogi, featuring a representative selection of the pieces on a 13x13 board, but otherwise using identical rules, was designed to make this game more accessible. It was published under the name Macadamia Shogi. Very smart to put those larger shogi variants up. All that is missing now is Dai Shogi (15x15), Tenjiku Shogi (16x16), and Tai Shogi (25x25). Oh yeah, and possibly Wa Shogi (11x11).